> NetApp > Tech OnTap Article: "Virtualizing Microsoft SharePoint"
SharePoint® 2010 will expand the physical footprint of your busy SharePoint environment. Take control by virtualizing with NetApp and Hyper-V™. 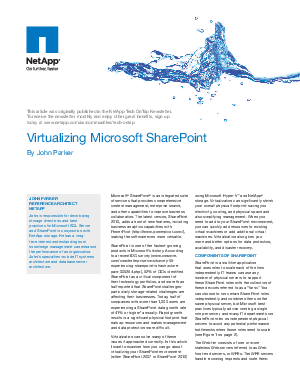 This article examines how you can go about virtualizing your SharePoint environment (either SharePoint 2007 or SharePoint 2010) using Microsoft Hyper-V™ and NetApp® storage allowing you to significantly shrink your overall physical footprint-saving you electricity, cooling, and physical space and also simplifying management.